As parents, we are constantly taking photos of our lives, but how often are we actually in the photos? I know that I have a really hard time finding photos of myself that aren't horrible quality selfies or a really bad angle of me that my 8 year old took when she sneakily stole my phone. Does that happen to anyone else or is that just my kids? Anyway, the point is that when our kids look back at old photos, they are going to want to see photos of us! Photos that show how much we love them, and how much they mean to us. Photos that show us laughing together and giving each other hugs and kisses. These are the photos I'd love to take of you and your kids. We will play games, dance, snuggle, tell jokes, horseplay, or whatever else your family likes to do together. I can't wait to meet your family and create not only beautiful images but also a fun family memory. Keep reading to find out about the specific sessions I offer! Outdoor Lifestyle sessions are booked around sunset and designed to capture happy smiles and natural, authentic moments between loved ones. We play games, dance, joke around, and create lasting memories. Your session will take place in your home, at nearby parks, natural areas, urban settings, or another location of your choice. In-home lifestyle sessions are all about your family and how you interact with each other in your home! These are fully (loosely) planned. Family, children, and maternity sessions will be based on the activities you enjoy doing together at home, whether it’s baking cookies, playing games, jumping on the bed, wrestling in the living room, reading by the fire or building blocks. With all sessions, I’m happy to provide you with complimentary styling advice! I can create vision boards based on your style and give suggestions on where to shop, etc. You will also have access to my client closet where you can borrow children’s clothing and women’s dresses. $100 retainer is due at booking to secure your date and goes toward your session fee. The prices apply to immediate family only. Please ask for a quote if you’d like to include other family members or friends and I will create a custom quote for you. Newborn lifestyle sessions are a relaxed way to capture your family with your new baby in the place that you feel most comfortable… your home. 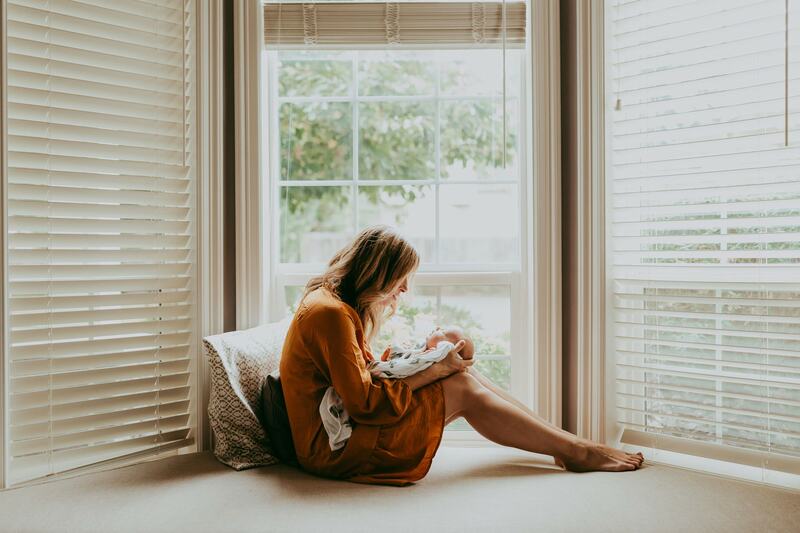 I can photograph baby in the nursery you worked so hard on, your older kids loving on their new sibling, your dog cuddling up to the family while you all snuggle on the couch, and all the other special moments that go along with bringing a new baby home. These aren’t posed sessions, but I do give relaxed direction so I can capture your family interacting in an authentic way. Since these are lifestyle, they really can be booked anytime, but generally 1-4 weeks after birth. I love when a baby is able to stay awake and really connect with their new family, so an older newborn would perfect, and it gives mom some time to recover from delivery. With all sessions, I’m happy to provide you with complimentary styling advice! I can create vision boards based on your style and give suggestions on where to shop, etc. You will also have access to my client closet where I have tons of kids clothing and women’s dresses available to borrow. Retainer: A $100 retainer is due at booking is required to reserve your session and is non-refundable, but may be applied to a future session within six months of the original date should we need to reschedule. Retainer is applied to the total amount of session and the remainder is due the day of. Location: If you wish to set up your session at a location that is more than a 40-minute drive from 97236, a reasonable travel fee may be assessed. Extended Families: Below prices include immediate family only. For extended families, there is a $30 per person fee for each extended family member. Smaller package may only be booked for extended families of 8 or less people. Rescheduling: I understand and hope you do as well, that there are incidences where some sessions may need to be rescheduled for another time. If weather (this is Oregon, after all), illness, or anything else outside of our control arises, your deposit will transfer to the new date. All digital images include a print release. Becca Jean Photography retains the rights to all images and does not sell unedited images. Photographer may present key images on her blog/website/Instagram/Facebook Page unless asked not to directly by the client.